Music for Kids – Make A Music Stick. Do you know what a Lagerphone is? If you know who The Bush Wackers are (were? ), or if you went to a lot of bush dances in your day, then you probably know what I’m talking about. If not, then think of a stick with lots of metal bottle caps hammered into it, and when you bash it with another stick or tap it on the ground it makes a noise. I guess you could say it is a ‘traditional Australian percussion instrument’, if you wanted to get technical. When our big boy asked if we could make a musical instrument, initially I was going to go with the easy to make, but somewhat boring, shaker. But then I had an idea…. I have vague memories of making a lagerphone as a child and loving it, so I decided that we’d go all out and make our own. Sadly, we are not a beer drinking family, nor do we drink anything else that comes with a metal bottle cap… so ours is not a traditional lagerphone and it doesn’t sound quite the same, so we renamed it the ‘Music Stick’. To make your very own Music Stick you need a decent sized stick, we used an old tent pole sawn in half. You need some bottle caps – we used a selection of plastic bottle caps, but it sounds even better if you use metal ones, and you need some nails with large heads. Because we used plastic bottle caps I needed to melt holes in them first by carefully heating a metal skewer and pushing it through each cap, make sure you do this outside because the melted plastic smells terrible (If you are using metal bottle caps you can just nail straight through them). 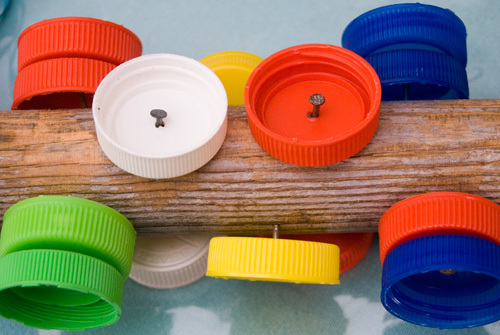 Then hammer your bottle caps onto your stick, make sure you don’t hammer the nail all the way in, the bottle cap needs to be loose so it jiggles around. To add a bit more jingle and pizzazz to our music stick we added some bells and streamers to the top. And to save our hard wood floors we added a piece of fleece padding to the bottom. How do you play your music stick? That’s easy! You tap it on the ground in time to the music. Or you can shake and jiggle it. Or you can even tap it with another smaller stick! Here’s a quick video of Morgan playing his music stick. The music he is playing along to is Songs of Connection by Alice Garrick at Alice Makes Music. The lovely Alice sent us a copy of her CD to listen to and we absolutely adore it. The CD is has some great songs on it. Of course my big boy likes the dinosaur songs and the girls like ‘Mad as a Wet Hen’…. and I’m often wandering around the house humming and singing “Lil Lil Lil Lil Lil…..”. This is not a CD of computer generated, teeny bopper, or cutsey kids songs…. it’s lovely, real, folksy music that is a joy to listen to. You can listen to Alice’s music on her website and also buy the CD or download the album from there. I feel like going downstairs and finding a stick or two. We certainly have the bottle tops and bells to go with them. Your idea is fantastic, Kate! We love listening to lots of different music, especially while playing in the play room or driving in the car. Jack Johnson and Friends ‘Sing-a-Longs and Lullabies for the film Curious George. Ok the kids have requested “Morgan on the TV” a million times lol. My favorite music to listen to with the kids is anything we can all sing along to! 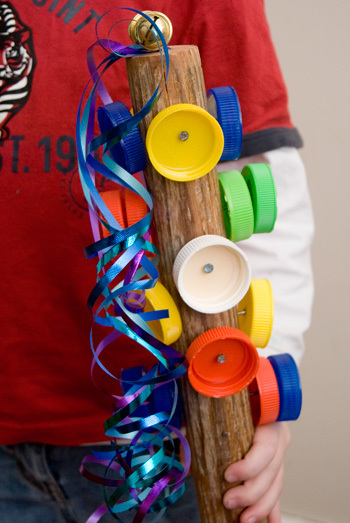 What a great idea for getting hammering and sticks into music – We’ll be doing this at kinder as soon as we’ve collected some metal bottle tops! At kinder we listen to what everyone likes – lots of diferent styles but Aunty Wendy’s Mob especially her CD Happy to be Me is very popular. Oh that is a lovely CD isn’t it… Make sure you google lagerphones because there are lots of types and styles and would be lots of fun to make some at kinder! Wow, that’s beautiful. I’m going to order some as gifts for all the small people who I like seeing at Christmas but don’t have any idea how to shop for. Kate, this is so fun! 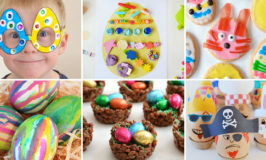 I love that you share simple, easy-to-make-with-what-you’ve-got-on-hand crafts for kids. I definitely want to make one of these now – it would go great with the ankle bells I’m working on! Please enter me in your draw for a downloaded copy of the CD! My peas LOVE music and singing and playing along to the beat (the little one even has a bit of rhythm – the big one not so much!). I LOVE this idea! 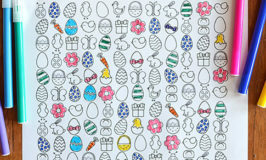 I have a feeling that my little ones will be doing this in the very near future! Thanks for the inspiration! what a great idea, we have been collecting caps for a while to use for arts and crafts and this will be a great idea. thanks for sharing. We love cat empire at the moment my kids LOVE all the brass. I know not really kids music but anything kids love is kids music in my opinion. Oh and yep I would love an old fashioned CD posted if I happen to win. You can buy a packet of unused beer bottle tops in the home brew section of supermarkets for the authentic sound! Oh of course! What a great idea if you don’t know anyone to help you collect bottle caps! Thanks for sharing! Freya loves to listen to Abba with me, and drags me up to dance with her. Beren prefers the white stripes. Thats a wonderful music stick!! I have a a pile of plastic lids, need to work on this, I know my daughter would love this. My kids and I like Ellis Paul! My daughter is 3 years old and love music. This would be a great craft to do together. Very nice idea! Love that music stick! The CD sounds excellent. We love listening to Play School CD’s together. We play them while we play or cook or whatever we do in our living space. I love music to fill our house. How kool – I remember the lagerphones at C & W bands. We like to listen to our Mainly Music cd’s, the music is very uplifting & you can’t help but sing along. 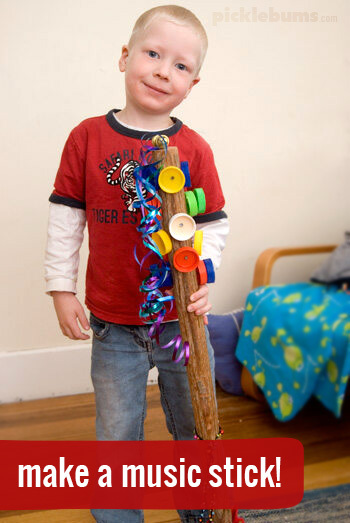 Home » Music for Kids – Make A Music Stick.